You can’t say it’s enough; experts recommend that you should make sure that your central heating system undergoes regular maintenance for many reasons. This is important when it comes to ensuring the integrity of the central heating system (making sure that all the components are entirely functional). Besides, regular maintenance and repair of the faulty system components ensures that reaches maximum performance. Note that repairing your central heating in time prevents premature wear and tear of different parts of the system. Besides, timely repairs and replacements (where necessary) prevents the inconveniences associated with central heating breakdowns during critical periods. At Eco Efficient, we provide real solutions to malfunctioning boilers and central heating systems. Check all the electrical components of the system and make sure that there is no possible short-circuiting and that the components are working perfectly. Check the motor and the blower’s squirrel cage to make sure that any possible problem is detected in time. Check the filter and find out if it requires replacement. Check the heating coil/the air conditioning especially if your central heating has a heat pump or air conditioning unit. 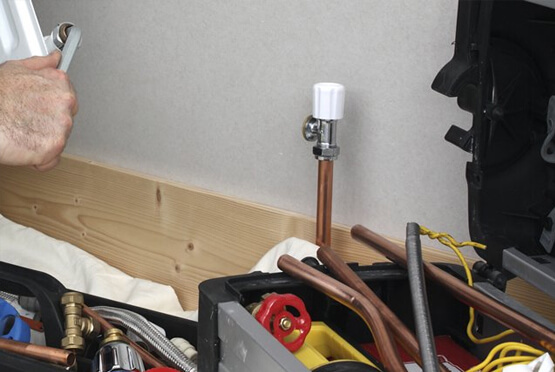 If you use a gas central heating system, then, our engineers will perform the above checks. In addition, they will perform the following checks. An entire gas gear check, including burner, gas valves, ignition system, and more. Examine the gas exhaust system. Note that for a gas central heating system, the exhaust vents must clear at all times. In most cases, these vents get blocked by spider webs and nests formed inside the vents or their openings. In all cases, regardless of the model or type of central heating system you are using, you should never ignore the inspection and cleaning of the ventilation ducts. Keep in mind that these ducts must be airtight and clean at all times. It’s worth mentioning that air leak can result in significant impact on your comfort and other people living in your home. Besides, air leak can make you think that the discomfort you’re experiencing is caused by the central heating. Eco Efficient has all the necessary resources, tools and equipment to help you clean and repair your central heating system. We have trained professional engineers who are focused on their work and won’t rest until your central heating system is operating efficiently. These engineers know what it takes to ensure a central heating system is running efficiently. Remember, an efficient central heating means that you will be paying lower energy bills.